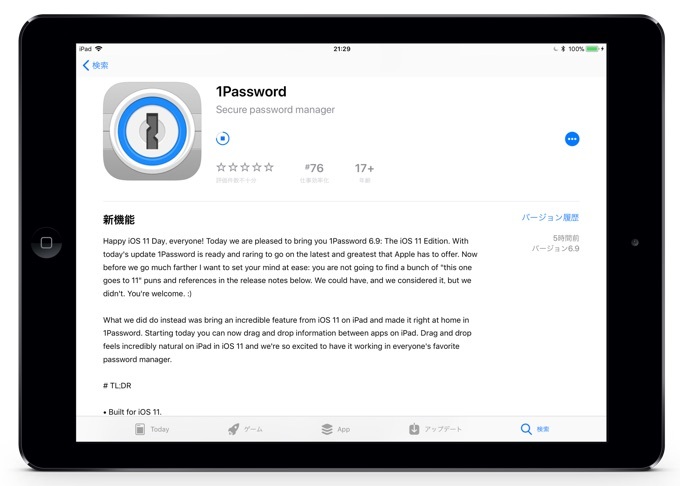 1Password for iOSがアップデートし、iOS 11およびドラッグ＆ドロップでのパスワード入力をサポート。 | AAPL Ch. Happy iOS 11 Day, everyone! Today we are pleased to bring you 1Password 6.9: The iOS 11 Edition. With today’s update 1Password is ready and raring to go on the latest and greatest that Apple has to offer. You can now drag usernames, passwords, and more out of 1Password on your iPad running iOS 11. Add information from Contacts easily by dragging and dropping into 1Password. Drag text into your items while editing them.